A computer model of the atomic structure of one of the new carbides (MoNbTaVWC5). Image: Pranab Sarker, Duke University. Materials scientists at Duke University and the University of California (UC) San Diego have discovered a new class of carbides that are predicted to be among the hardest materials with the highest melting points in existence. Made from inexpensive metals, the new materials may soon find use in a wide range of industries, from machinery and hardware to aerospace. A team of materials scientists at Duke University and UC San Diego have now announced the discovery of a new class of carbides that combine carbon with five different metallic elements at once. They report this new class in a paper in Nature Communications. Achieving stability from the chaotic mixture of their component atoms rather than an orderly atomic structure, these materials were computationally predicted to exist by the researchers at Duke University and then successfully synthesized at UC San Diego. "These materials are harder and lighter in weight than current carbides," said Stefano Curtarolo, professor of mechanical engineering and materials science at Duke. "They also have very high melting points and are made out of relatively cheap material mixtures. This combination of attributes should make them very useful to a wide range of industries." When students learn about molecular structures, they're shown crystals like salt, which resembles a 3D checkerboard. These materials gain their stability and strength through regular, ordered atomic bonds, where the atoms fit together like pieces of a jigsaw puzzle. Imperfections in a crystalline structure can, however, often add strength to a material. If cracks start to propagate along a line of molecular bonds, for example, a group of misaligned structures can stop it in its tracks. Hardening solid metals by creating the perfect amount of disorder is achieved through a process of heating and quenching called annealing. The new class of five-metal carbides takes this idea to the next level. Jettisoning any reliance on crystalline structures and bonds for their stability, these materials rely completely on disorder. While a pile of baseballs won't stand on its own, a pile of baseballs, shoes, bats, hats and gloves just might. The difficulty lies in predicting which combination of elements will stand firm. Trying to make new materials is expensive and time-consuming. Computing atomic interactions from first principle simulations is even more so. And with five slots for metallic elements and 91 to choose from, the number of potential recipes quickly becomes daunting. "To figure out which combinations will mix well, you have to do a spectral analysis based on entropy," explained Pranab Sarker, a postdoctoral associate in Curtarolo's lab and one of the first authors of the paper. "Entropy is incredibly time-consuming and difficult to calculate by building a model atom-by-atom. So we tried something different." If the results were spread far apart, it indicated that the combination would likely favor a single configuration and fall apart – like having too many baseballs in the mix. But if there were many configurations tightly clumped together, it indicated the material would likely form many different structures all at once, providing the disorder needed for structural stability. The group then tested its theory by getting colleague Kenneth Vecchio, professor of nanoengineering at UC San Diego, to attempt to make nine of the compounds. This was done by combining the elements in each recipe in a finely powdered form, and then pressing them together at temperatures of up to 4000°F and running 2000 amps of current directly through them. "Learning to process these materials was a difficult task," said Tyler Harrington, a PhD student in Vecchio's lab and co-first author of the paper. "They behave differently than any materials that we've ever dealt with, even the traditional carbides." The scientists chose the three recipes their system deemed most likely to form a stable material, the two least likely, and four random combinations that scored in between. As predicted, the three most likely candidates were successful while the two least likely were not. Three of the four intermediate scorers also formed stable structures. 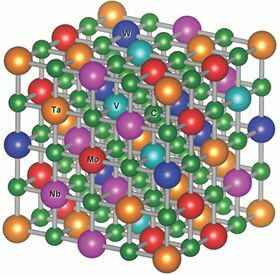 While the new carbides are all likely to have desirable industrial properties, one improbable combination stood out – a combination of molybdenum, niobium, tantalum, vanadium and tungsten (MoNbTaVWC5). "Getting this set of elements to combine is basically like trying to squeeze together a bunch of squares and hexagons," said Cormac Toher, an assistant research professor in Curtarolo's laboratory. "Going on intuition alone, you'd never think that combination would be feasible. But it turns out that the best candidates are actually counterintuitive." "We don't know its exact properties yet because it hasn't been fully tested," said Curtarolo. "But once we get it into the laboratory in the next couple of months, I wouldn't be surprised if it turned out to be the hardest material with the highest melting point ever made." "This collaboration is a team of researchers focused on demonstrating the unique and potentially paradigm-changing implications of this new approach," said Vecchio. "We are using innovative approaches to first-principles modeling, combined with state-of-the-art synthesis and characterization tools, to provide the integrated 'closed-loop' methodology so necessary for advanced materials discovery." A new model can account for irregularities in how atoms in materials such as metals arrange themselves at so-called ‘grain boundaries’. The US Department of Labor’s has approved its first-ever Additive Manufacturing (AM) Technician Registered Apprenticeship, according to America Makes.